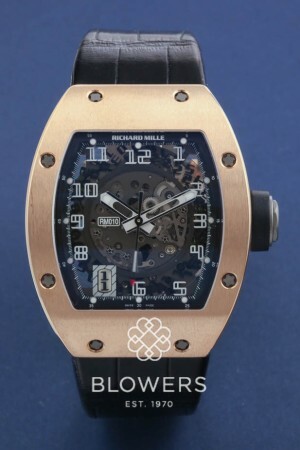 18ct Rose gold Richard Mille RM 010. Case diameter, length 48 mm x 39.30 mm (widest point) x 13.84 mm (thickest area) water resistant to 50 meters. Automatic movement with hours, minutes, seconds, date and adjustable rotor geometry. Sapphire crystal dial with white numeral hour markers, exhibiting the movement, see through case back. Black croc strap with 18ct gold RM10 spring folding clasp. Box and papers dated November 2013. SKU: 3035027. Categories: Richard Mille.